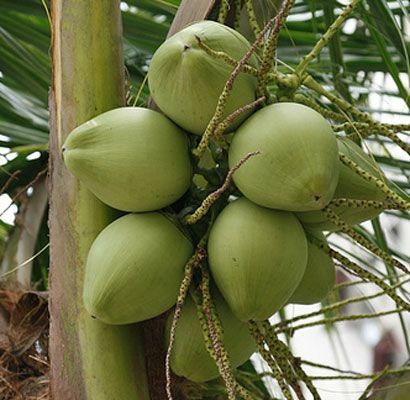 Medical plant Coconut or(Cocos nucifera), including the type of plant that has a palm-sized pieces large enough. Coconut trees are generally standing erect and unbranched, and can reach 10-14 meters. Berpelepah leaves, the length can reach 3-4 meters with fins stick that support each strand. Fruit and nuts wrapped in a fiber that is strong enough so as to obtain coconuts must be skinned first. Coconut is already large and lush palm can produce 20-10 fruits per stem. Old coconuts contain high calories, amounting to 359 cal per 100 grams; old half coconut meat contains 180 calories per 100 gram cal and young coconut meat calories by 68 cal per 100 grams. Being the average calorific value contained in the coconut milk around 17 calories per 100 grams. Green coconut water, compared with many other palm species contain tannins or antidotum (anti-poison) the most high. Other chemical substances that stands out is in the form of enzymes that can break down toxic properties. Composition of chemical substances contained in coconut water include ascorbic acid or vitamin C, protein, fat, carbohydrate, calcium or potassium. The minerals contained in the coconut water is iron, phosphorus and sugar consisting of glucose, fructose and sucrose. Water content contained on coconuts number of 95.5 grams per 100 grams.